A decade ago, New York City made a deal for 20 automated public toilets — APTs, for short — to be installed in all five boroughs, at the behest of Mayor Michael Bloomberg. They are squat, rectangular metal huts outfitted with the essentials: a low toilet, a shiny sink with running water, panic buttons. If a ticket booth and an Amtrak bathroom got together, this would be the result. A quarter gets you entry and 15 undisturbed minutes. Once you exit, the doors clamp shut and a mechanism releases a spray of disinfectant. Three were installed. Two more have been put in place but haven’t been switched on yet. The other 15 are still sitting in a warehouse in Maspeth, Queens. Other global cities have public restrooms everywhere. Yet the women (and the more decorous men) of America’s cultural capital still end up pleading with a restaurant hostess or Starbucks manager or hotel clerk or, God forbid, heading into Penn Station. Failing that, some of us just find a shadowy nook and pray that there aren’t any cops around. But the lack of public toilets, it turns out, is not for lack of trying. The least ridiculous way to deal with that is to build some restrooms. A plan to do just that took shape early in Michael Bloomberg’s first term — an early cause, if not the first unconventional one, for the mayor. ”The public does have a need, and most other cities, or many other cities, have solved this problem,” Bloomberg said in June 2002. ”And we’re going to try to work on it.” His predecessors, Rudolph Giuliani and David Dinkins, also tried to push through plans to give New Yorkers a place to go. Both had come up short. More than 3,450 Cemusa bus shelters and 300 newsstands have been installed in the past decade, but only three public toilets made it onto the streets. The first appeared in Madison Square Park in 2008, and the second in Corona Plaza in Queens later that year. Grand Army Plaza, in Brooklyn, got the last one in 2011. Why has installation been so backed up? A spokesperson for the Department of Transportation, which oversees the coordinated street-furniture program, would not comment on specifics but said installation is “challenging.” There is no specific timeline for getting all these APTs out on the street, and finding places that are ready and willing to install them turns out to be a pain. There are infrastructure requirements: enough sidewalk space; they must be certain distances from curbs, fire hydrants, grates, and other structures already built into the city’s anatomy. Sewer access, obviously; electrical service. If they’re near parks, the Parks Department also weighs in. Since the exteriors carry advertising, which parks are required to eschew, that’s an extra complication. Cost isn’t a huge barrier. 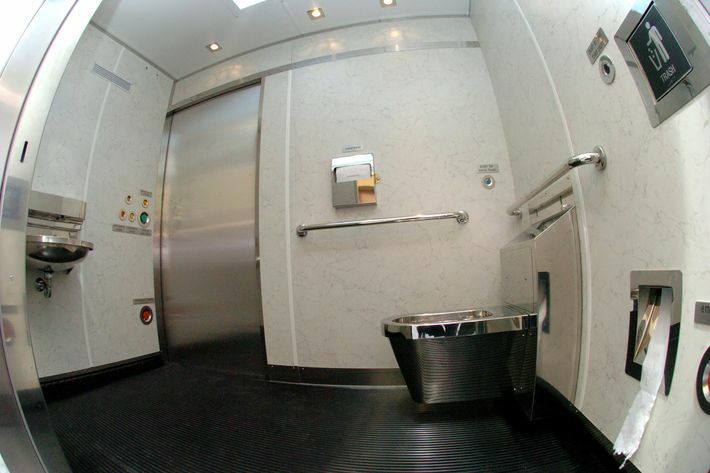 Each toilet costs about $175,000. That price tag does not include the cost of installation, which varies depending on the site — and it’s covered by JCDecaux, not the city. Neither the DOT nor JCDecaux would confirm the cost of annual maintenance, but an inspector goes out three times per week, plus whenever a 311 call requires a response. The Public Design Commission adds another layer to the bureaucratic wrangling. The Commission reviews and approves every placement — even if it meets all of DOT’s requirements. The body polices the aesthetics, and can reject the toilet if it thinks it obstructs a landmark or plaza or some artwork. It can reject it if just one of the commissioners thinks a bathroom would make an outdoor space cluttered. “I’m still waiting,” said Robert Perris, the district manager for Brooklyn Community Board 2, which covers downtown Brooklyn, to Daily Intelligencer. Perris just celebrated his ninth anniversary of trying to get just one APT in his neighborhood. The city had solicited suggestions, says Perris, and he and the community board threw out a few, including a spot in Columbus Park by Borough Hall and a location on Fulton Mall. “Everywhere we tried to put it just met resistance,” he said. Fulton Mall got shot down because of concerns about construction. Columbus Park was a solid candidate, until the idea came up against the Public Design Commission. “The stainless-steel, modern-looking convenience was completely out of character with the Victorian park,” Perris said they’d told him. “The ‘Victorian park’ was constructed in the ’80s.” Finally, a spot on Tillary Street on the edge of Cadman Plaza Park passed muster. A toilet is coming there in spring 2016. So things are finally moving again. 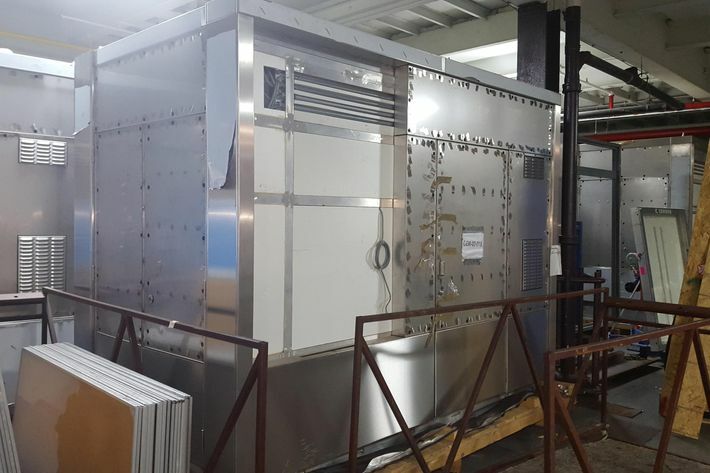 Besides Tillary Street, two more toilets have actually left the warehouse and are almost open for your business: one in the newly redesigned pedestrian Plaza de las Americas in Washington Heights, and another at East Fordham Plaza and Third Avenue in the Bronx. The one uptown, says Dennis Reeder, the executive director of the Washington Heights–Inwood Development Corporation, took all of a day to position, although the electricity hookup will take a few more weeks. “They just hoist it into place,” he said. Reeder said his group had a little ceremony in January upon its arrival; they’ll have another in March to re-acknowledge it and also dedicate a new information kiosk. Twenty stalls for 8 million people, plus tourists, will chip away at the restroom problem the way a square of toilet paper can wipe up an oil spill. But it’s something, and the toilets do get used, though at rates lower than you’d imagine. 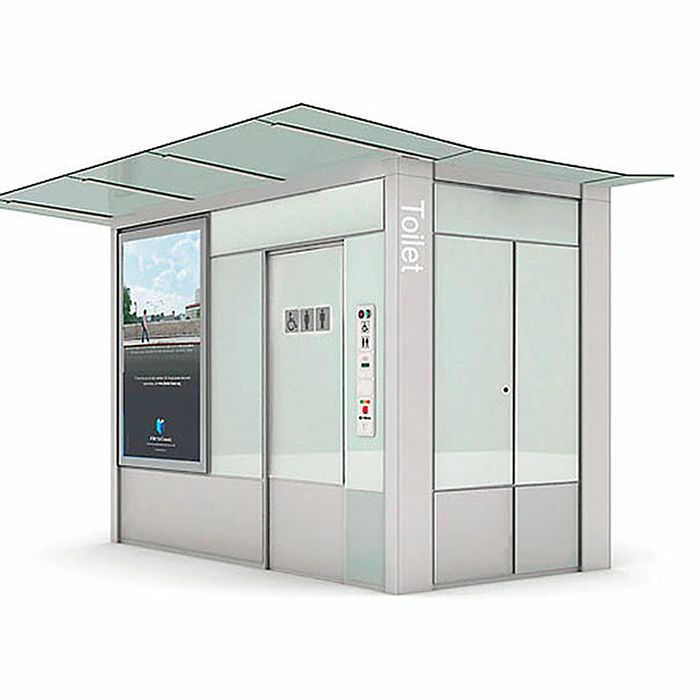 The three active public toilets had 912 users in December, according to the most recent stats from JCDecaux. Corona Plaza — which is close to the 7 train — had the most, with 414. Madison Square Park’s toilet had the fewest of the three. Altogether, that’s $228 worth of income, from about one user per hour in each restroom. I went there to have a look at it. The sliding door was stuck open to the street. The lights were on, and sent a dingy shadow out onto the sidewalk. 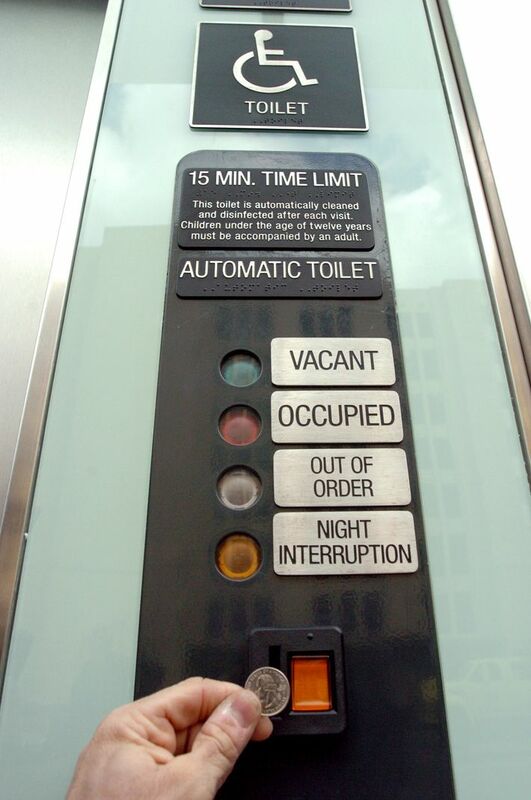 Two buttons by the door were lit up: one to warn that the toilet was occupied, the second to indicate that it was out of order. The first, thankfully, was untrue. I ignored the second and put 25 cents’ worth of change in. The machine swallowed my dimes. Nothing happened. I stepped in. Wads of paper soaked in the toilet. The ground was speckled white, probably with salt dragged in on someone’s boots. The sink had hot water. The APT smelled exactly like every other public restroom: damp and sweaty, with a ghostlike whiff of bleach. But at 8 p.m. — closing time for all APTs — a man armed with a broom and dustpan who said he worked for the Department of Transportation pulled up. He said he would reboot the toilet, but since it was now after hours, the restroom wouldn’t be in service until about 8 a.m.
Ricardi Calixte, the deputy director of the Queens Economic Development Corporation, oversees Corona Plaza. He said he hadn’t heard much about the toilet — maybe a few complaints about the door not closing or its being out of order, but those are rare. Which makes sense. Who wants to talk about going to the bathroom, anyway?